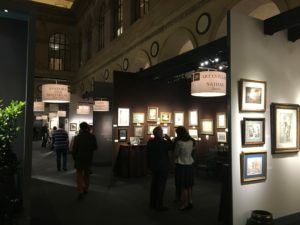 The Salon Du Dessin is an annual event in Paris that is one of the most prestigious shows in the world and this year marked the 26th anniversary. Dessin is “drawing” in French and the show deals strictly with works on paper. That includes pencil or ink drawings and watercolors or gouache on paper. You will not find any oil on canvas here. 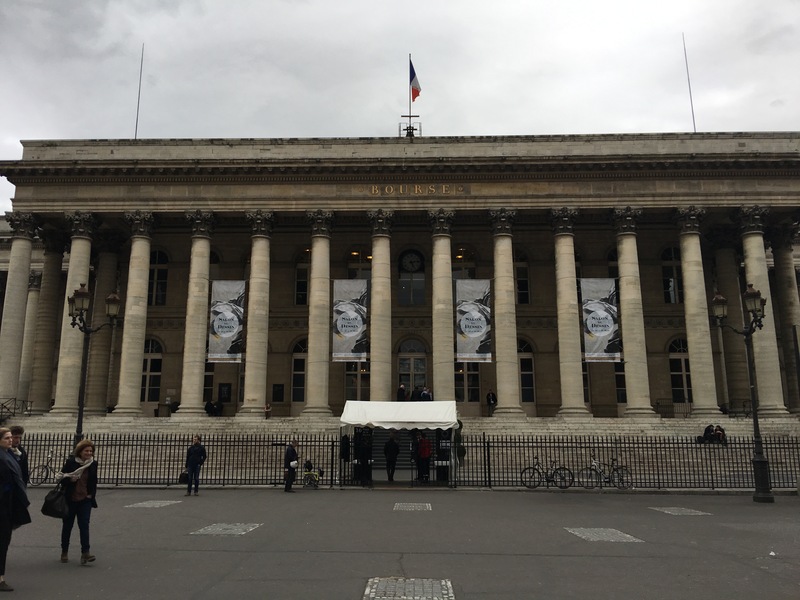 It is held in the elegant Palais Brongniart in the Place de la Bourse. 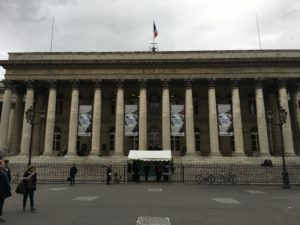 An interesting note is that this used to be the home of the Paris stock exchange where Paul Gauguin once worked before he devoted his life to art. 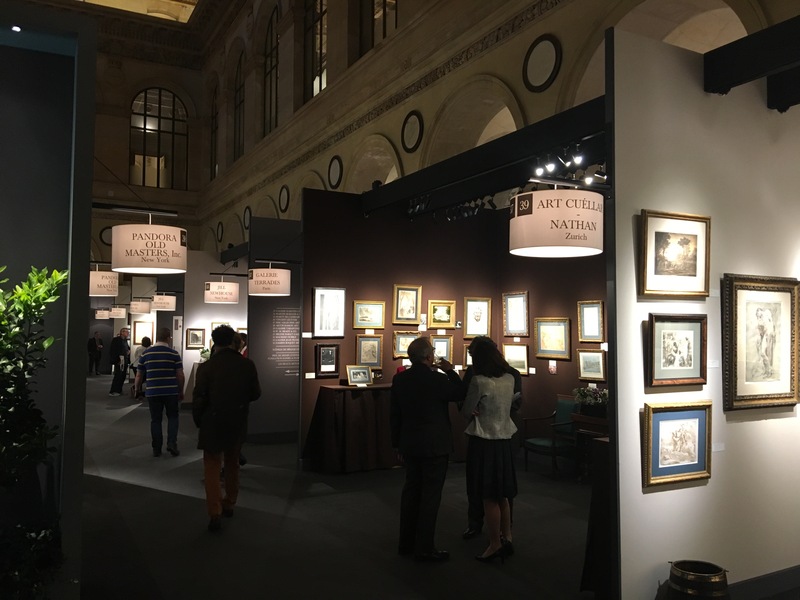 The Salon du Dessin is a made-in-France success that is admired around the world. 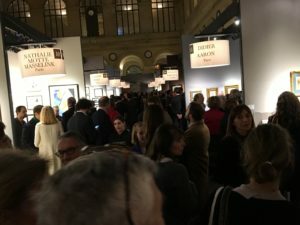 For an entire week, it brings together art lovers, collectors, novices, and museum curators interested in drawings, whether old masters or modern. 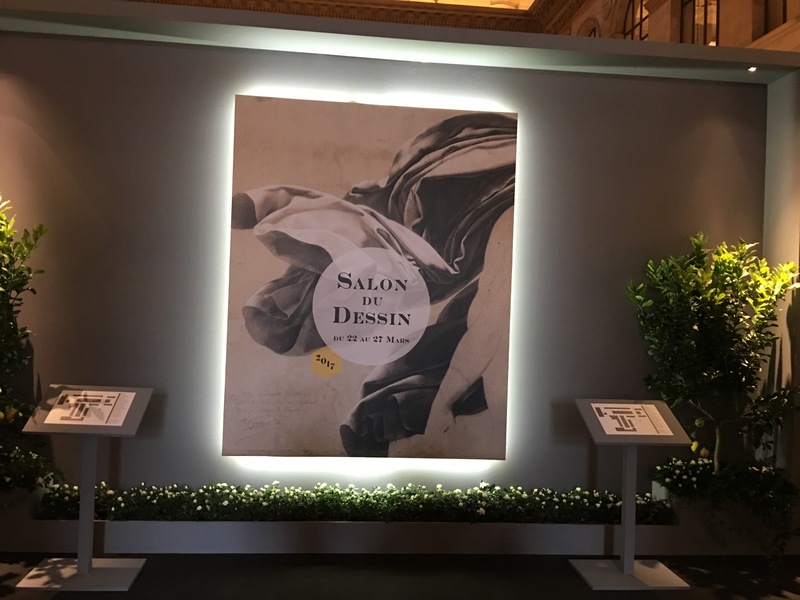 During this week, the Salon du Dessin is the epicentre of the Paris cultural scene. An entrance ticket to the Vernissage is special and again this year I need to thank Jill and Christa from the Jill Newhouse Gallery of New York for that. The opening was packed and the crowd was very intellectual and attentive and the wealth of expertise of the dealers did not disappoint. 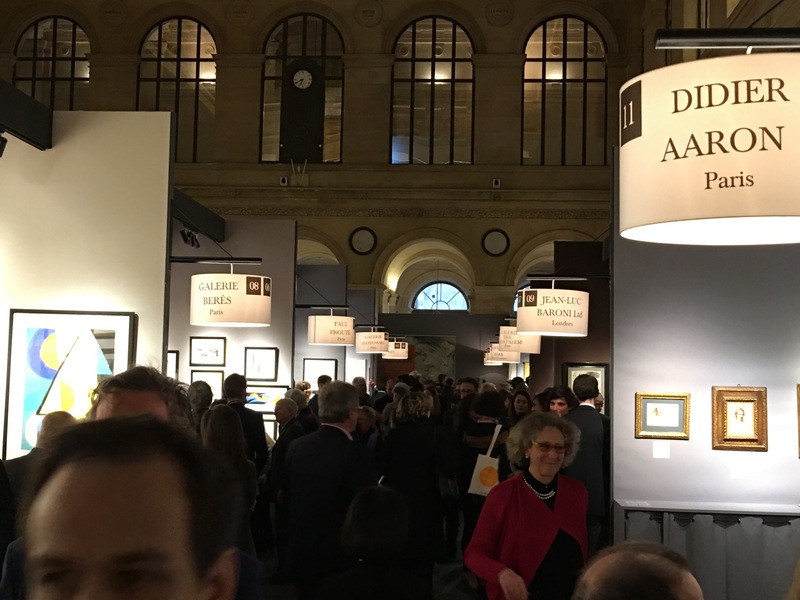 Here are a few interesting quotes about the Salon Du Dessin. “It wasn’t so long ago that drawing was forgotten, neglected, just the poor relation of painting”, says Pierre Rosenberg, member of the académie Française and honorary director of the musée du louvre. 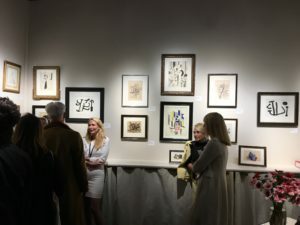 “Drawing corresponds to today’s sensibilities, at a time when the image is all-important”, says Bertrand Gautier, one of the organisers of the Salon du Dessin. 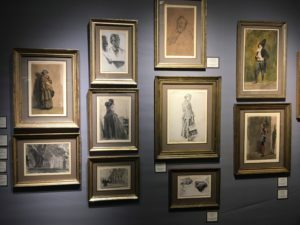 The current taste for drawing can also be attributed to the increased attention we now pay to the artist and the fact that drawing brings us closer to his or her intimate world. Hervé Aaron, one of the founders of the Salon du dessin and its president for 14 years. 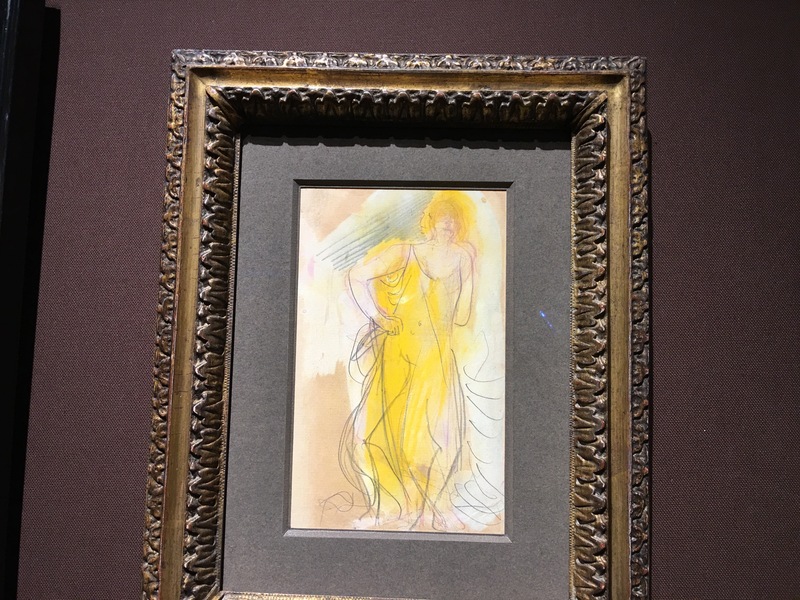 One of my favorite pictures in the show was the beautiful drawing colored with gouache by Auguste Rodin shown below. 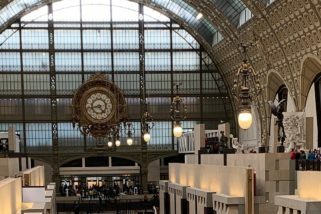 It was in the stand operated by Galerie Coatalem of Paris. It did show the revered little red dot on the wall tag which is the universal sign in the art world that this piece has been sold. 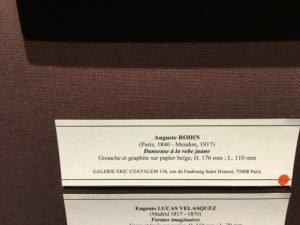 It is the 100 year anniversary of Rodin’s death and everything I saw by him was sold. There is a lot of focus on him in Paris right now including a big show in the Grand Palais I will be attending. When you are as curious as I am and it is something that you really admire, you have to try to figure out how much it was sold for to log away in your knowledge base. It is not easy because out of respect for the buyer, it is not polite or ethical for any seller to reveal how much they sold something for, so you have to get creative. 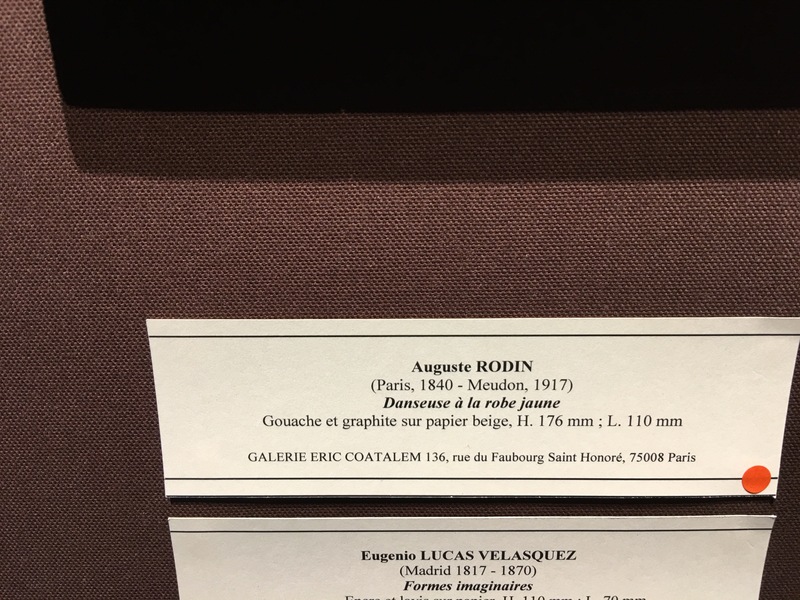 I asked Eric Coatalem what the price range of Rodin drawings with gouache on paper of that size would be. He smiled, understanding what I was up to, and said anywhere from 40,000-70,000 euros depending on the quality of the color. 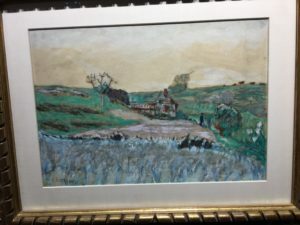 I paused and turned to study the picture for a few seconds and then I turned back to Eric and commented that I thought the color on that piece was pretty strong and I wondered if he would agree? He gave me a bigger smile and raised his eyebrows, but remained silent. You do not have to be Sherlock Holmes to figure out that this wasn’t one of the 40,000 euro ones. My favorite picture in the show was the beautiful little watercolor and gouache by Andre Derain in the stand of Brame & Lorenceau Gallery of Paris and it was only 13,000 euros which is pretty reasonable by show standards. Derain was a cofounder of the “Fauvist” with Henri Matisse and he has long been one of my favorites. They were called the “Fauvists”, or “wild beasts”, by a critic because of their wild use of color. 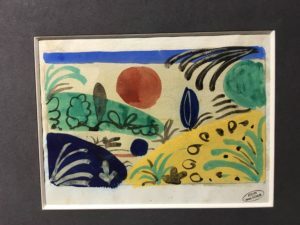 The little stamp at the bottom right says “Atelier Andre Derain”and it is an estate mark applied by the family after his death. Even though it is unsigned the stamp certifies that it came from his studio or Atelier. 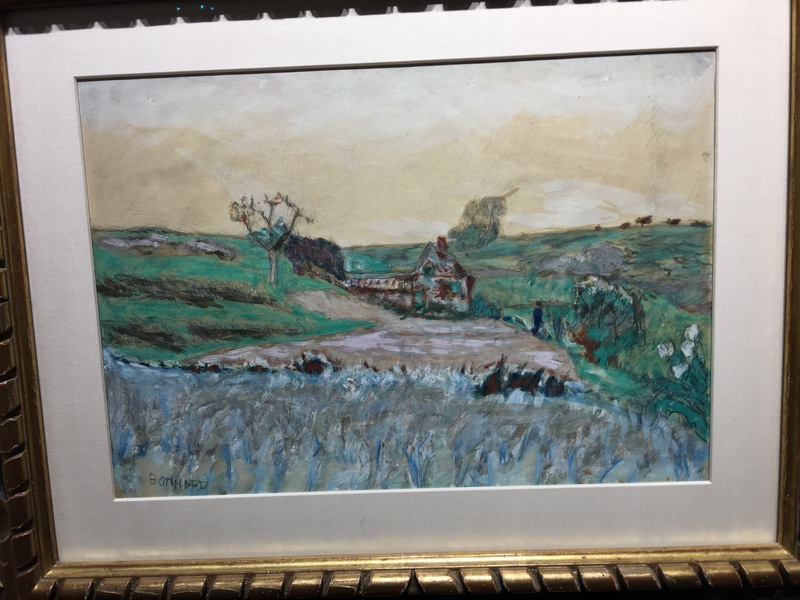 The Pierre Bonnard watercolor with Jill Newhouse is also high on my list of favorites, but much more expensive. Do not forget about clicking twice on the pictures to get a really close up view of these pictures. French painter Fernand Léger (1881-1955) blended elements of Cubism with his own unique style. 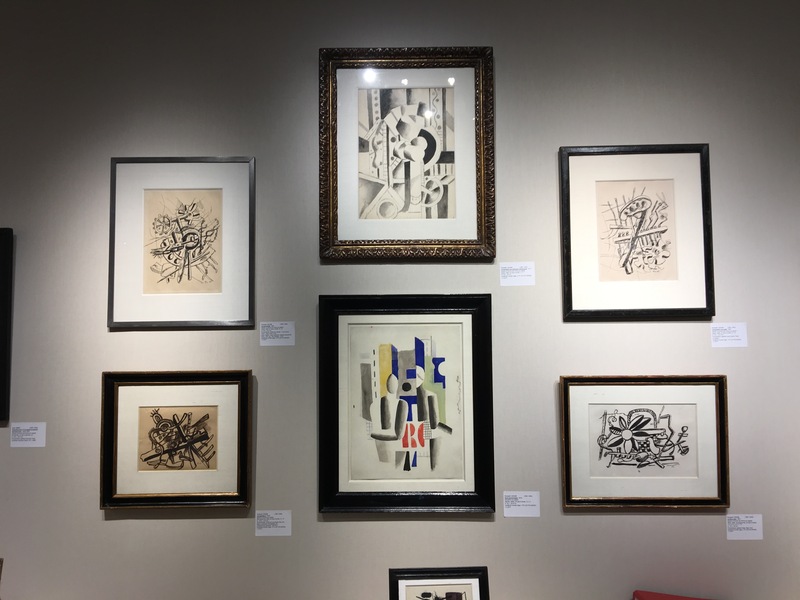 This group below of works by him are in the stand of Galerie Berès of Paris. I met these ladies in Maastricht a couple of weeks ago. 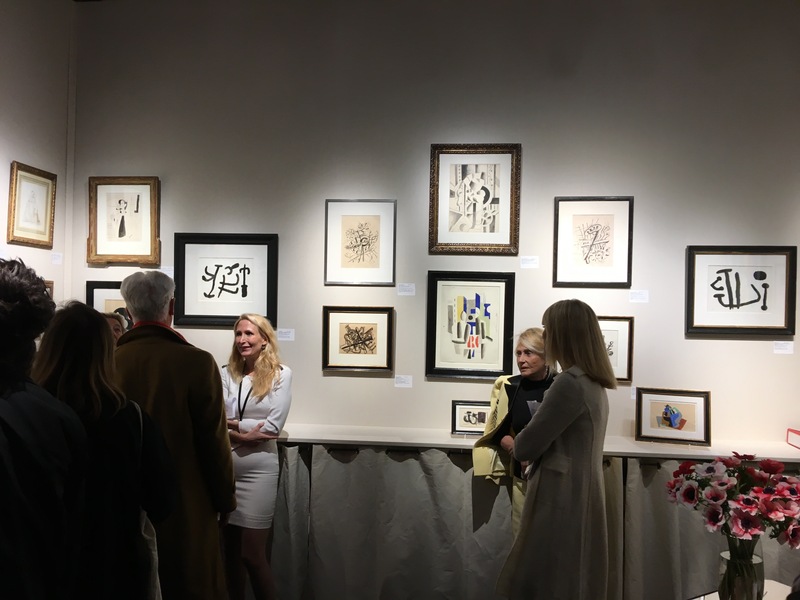 The gallery was founded by Huguette Berès in 1951 and is now run by her daughter Anisabelle Berès and her daughter. They are the two ladies leaning against the table in the back facing us. 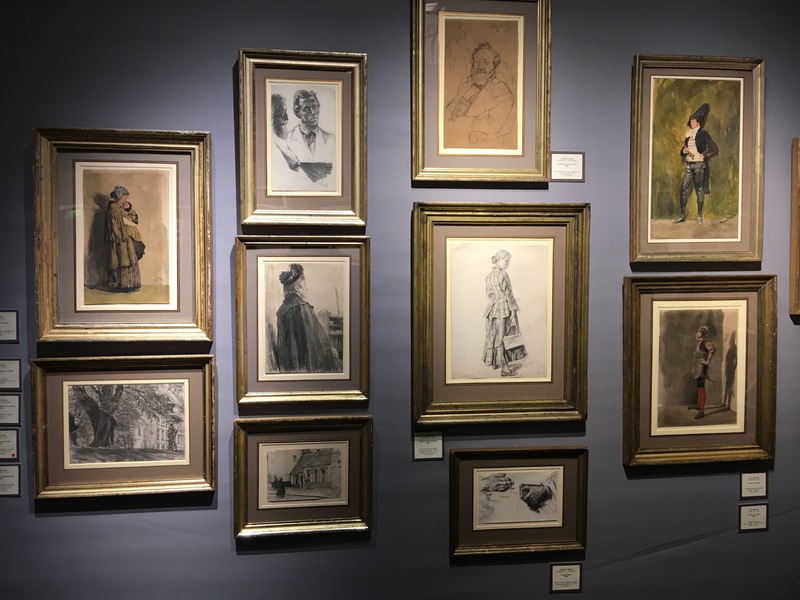 After 11 days in Maastricht and having one day to get to Paris and set up at the Salon Du Dessin I am surprised they are even standing. The image on the right better shows the pictures they are standing in front of. Do not forget to click on them for a larger image. 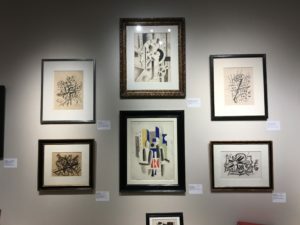 The beautiful watercolor Leger in the center bottom done at the peak of his career in 1919 is 300,000 euros. The larger drawing on top is done about the same time is 270,000 euros. The four drawings on each side are about 45,000 euros each and were done much later in his life shortly before his death in 1955. The Salon du Dessin is a an incredibly entertaining and educational event and if you ever find yourself in Paris during the 3rd week in March I would not miss it.